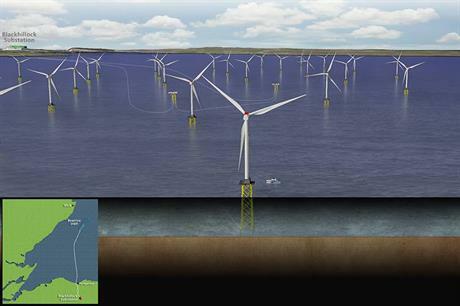 UK: The development consortium behind the 588MW Beatrice offshore wind project has given a positive final investment decision to build the offshore project. SSE and its financial partners, Copenhagen Infrastructure Partners (CIP) and Chinese state-owned investment holding company State Development and Investment Corporation (SDIC), have approved the go-ahead of the £2.6 billion (€3.35 billion) project. Beatrice is located 14 kilometres off the Scottish east coast in the Moray Firth. Offshore construction of the project is expected to begin in 2017, with commissioning due in 2019. Siemens has been contracted to supply 84 7MW turbines to the project, as well as two of its offshore transformer modules (OTM) — in place of a traditional substation. Siemens will also work in conjunction with cable supplier Nexans to deliver export cables to the project. It is Siemens' first confirmed order for the OTM system, unveiled at the EWEA Offshore conference and exhibition in Copenhagen last year. Mainstream Renewable Power's Neart Na Gaoithe offshore project has also indicated it would use the system, but the order is yet to be confirmed. Installation specialist Subsea Heavy Lifting and its parent company Subsea 7 will carry out the engineering, procurement, construction and installation of the project's turbine jacket foundations and inter-array cables. The project began as a joint venture between SSE and Repsol Nuevas Energias UK. SSE sold a portion of its stake to CIP in November 2014. In February 2016, SDIC acquired Repsol's 25% stake in the project as part of a wider deal, which included the acquisition of the 784MW Inch Cape project. As a result, SSE owns 50% of Beatrice, with CIP and SDIC each holding 25% of the project. The European Investment Bank will invest £525 million towards the construction phase of the project. It is EIB's largest ever contribution to an offshore wind project, the Bank said. Beatrice is the fifth and final offshore development to reach a final investment decision (FID) of those that were awarded FID-enabling contract for difference support agreements by the UK government in April 2014. With 5.1GW operational, 0.8GW being built and 4.3GW having reached FIDs, offshore wind is set to provide 10% of the UK's electricity needs by 2020. Offshore wind already delivers 5%, according to trade body RenewableUK.